WE ARE OPEN!!!! Watch our Website & Social Media pages for Updates **** New & Exciting Changes Coming Soon !!!! 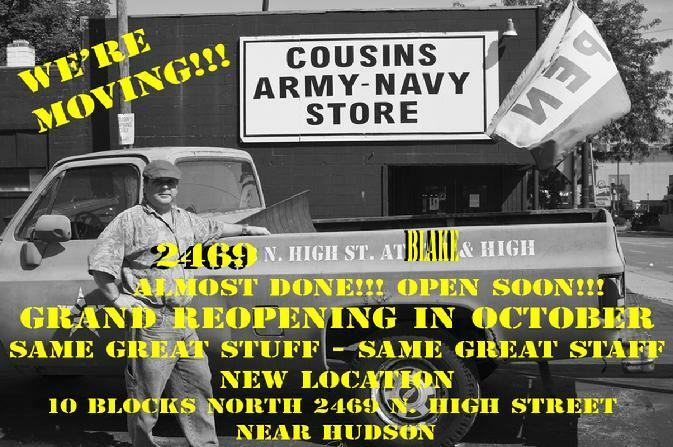 **** Join Us & become a part of the COUSINS LEGACY ! Come on in to visit and see all that we have in our new location. Plenty of FREE PARKING in our lot behind the store or on High Street near our front door. Since July 4, 1970 it has been our honor & privilege to serve you with knowledgeable service & a unique offering of items rarely found anywhere else. so check us out today and see something new on your next visit! We have much more than listed here! We are happy to take phoned mail-orders. WE WILL SOON BE LAUNCHING OUR NEW E-COMMERCE WEBSITE WHERE YOU CAN ORDER ONLINE!!!! Either way, you can count on all of the Goods & Gear you have come to expect from COUSINS!